After the close of a fortnight at once surprising and unsurprising, we review the notable figures in the WTA field at the Australian Open. Grading influenced by expectations, quality of competition, and other factors in addition to raw results. Enjoy this tournament review? Come back tomorrow for the ATP edition. A lot of people are going to publish articles about Samantha Stosur in the next few hours. About how she lost early in Australia again. About how she snatched defeat from the jaws of victory and how she once again crumbled under the pressure of playing at home. How she choked and let her undersized opponent back into the match. About how she is a talented player with a big serve and forehand, how she has won a Grand Slam title, and how mysterious it is that she cannot string together wins in her home country. This will not be one of those articles. Instead, I’m going to talk about Zheng Jie. A player without the Slam title but arguably twice the talent with flat strokes that belie her size. A pioneer for Chinese tennis, the first Chinese woman to reach a major semifinal at Wimbledon. A courageous competitor who took Serena Williams to 9-7 in the third on the London lawns a year ago and beat Stosur herself two weeks ago in a three grueling sets. The winner of her second round match, defeating Stosur 6-4, 1-6, 7-5. Zheng took the court understandably full of belief; her opponent’s struggles in Australia are as notorious as they are well documented. Combine those external circumstances with the inconvenient truth that Zheng’s flat, on the rise groundstrokes match up well against Stosur’s more mechanical, time-dependent game style and the unseeded Chinesewoman was the overwhelming favorite. She certainly played like the favorite for most of the first set. Taking precious time away from Stosur, Zheng dominated the No. 9 seed from the back of the court, showing the partisan crowd why she has been ranked as high as 15 in the world. Despite a late wobble, she closed on her eighth set point and looked set to be Stosur’s yearly Melbourne conqueror. For the next set and a half, things began to change. Stosur stopped missing, and Zheng’s laser-like shots lost their pinpoint accuracy. The crowd got involved and for a moment, Stosur forgot she was playing in Australia. As the Chinesewoman fell behind a double break in the third set she struck a disconsolate figure, out of energy and out of ideas. In a manner reminiscent of everywhere (not just Australia), Stosur began to pull back. The embarrassing shanks that haunted her throughout the first set were coming in streams. Despite a jittery finish, she still found herself within two points of the third round. Enter “JZ.” Like a boss. Using her veteran sensibility, Zheng took full advantage of the shorter ball she was now getting. She stepped up and into the court, outfoxing Stosur from the baseline and passing her at the net. Breaking the Aussie twice to level, the rest of the match appeared only a formality. Stosur had retreated, Zheng had advanced; there would be no more violent shifts in momentum. Almost three days into the first week, this match was one of the best the tournament had to offer. The first match on Rod Laver Arena to go the distance, it exhibited breathtaking rallies, intelligent shotmaking, and a very tense ending. But it was not a match that Sam Stosur lost. This was a match that Zheng Jie won. It was a hard-earned victory, one that does not deserved to be sullied by the insinuation that she benefited from a choke. Stosur may have left the door open on her way to the round of 32, but it was up to Zheng to walk through and kick the Aussie out. Kick she did, and she was rewarded with a day in the sun. After she had lost a painful three-setter to Zheng Jie in Sydney last week, Sam Stosur must have entered Rod Laver Arena with thoughts of revenge as well as some trepidation. The only Aussie women left in the singles draw, she had compiled a history of underachievement on home soil. Moreover, Stosur recently had recovered from surgery for a bone spur near her ankle, so she had looked rusty in her first few matches of 2013. What awaited was a stunning collapse at her home major that rivaled any of her disasters there before, although a different outcome looked likely if not nearly certain at more than one juncture. Her confidence perhaps boosted by the first-round victory, the home hope started more solidly on serve than she had in Sydney. An errant forehand from Zheng produced an early break point for Stosur, but a netted backhand let the opportunity escape. The former US Open champion earned success by stretching the tenacious Chinese star wide along the baseline from the outset of the rallies, and by exploiting her physical limitations with kick serves and topspin-heavy groundstrokes. For her part, Zheng did what most of Stosur’s opponents try to do in finding her backhand wing, much less imposing than her forehand. But her second serve was a liability on which the Aussie tried to pounce, connecting on some return winners while spraying others well wide. Through the first several games, Stosur held serve more comfortably than did Zheng, reversing a trend from their previous meeting. That pattern ended in the fifth game, when a horrifically shanked second serve that landed over the baseline set up two break points. Remarkably unruffled by the embarrassment, Stosur bounced back to hold with more accurate groundstrokes. She found herself in trouble again at 3-3, however, following a brilliantly angled backhand pass from Zheng that negated a strong approach. Watching a forehand return winner dart past her cross-court, Stosur faced triple break point. An entertaining cat-and-mouse exchange ensured with Zheng at the net and Stosur at the baseline, but the Chinese secured the last word with a deft volley. Having claimed the first break of the match, Zheng opened her attempt to consolidate with a double fault. Emboldened by that ominous start, Stosur swung more confidently on her returns and soon drew level with consecutive forehand winners. She began to dictate the rallies more regularly as she ran around her backhand more often. That effort went wasted after a dreadful service game in which she yielded three double faults and an unforced error on break point, allowing Zheng to serve for the set. This time, the Chinese moved quickly to triple set point, only to let all three slip away. A double fault erased a fourth, an unforced error a fifth, and a spectacular defensive lob from Stosur contributed to erasing a sixth just when Zheng looked on the verge of ended a rally that she had controlled. As she continue to struggle with her backhand, Stosur watched a seventh set point slip away and threatened to save an eighth as well. But she shanked a routine drive volley well long to end the epic game and sink into a one-set hole. As Zheng’s steady defense continued to chip away, Stosur wobbled through another treacherous service game. Six deuces and two break points later, she ended a two-game stretch that had lasted 34 points. Stosur began to venture towards the net more often, sometimes succeeding in taking time away from Zheng and sometimes punished by her opponent’s crisp passing shots. Two explosive forehand returns enabled her to record the first break of the second set, in the fourth game. As her confidence rose, Stosur began to prey upon Zheng’s serve more ruthlessly. An insurance break sealed by a sequence of penetrating forehands allowed her to cruise through the second set. To this stage, the match had resembled their Sydney encounter, although that second set had reached a tiebreak. More self-assured in her body language now, Stosur began to show the poise that she needed to sustain her momentum in the third. In the first game of the final set, she won a long backhand-to-backhand exchange with the sort of patience that had eluded her in the first set. Now more in control of her weapons, the Aussie earned an immediate break from the fading Zheng. Another brief momentum shift awaited when she dropped her serve at love with a double fault, but her opponent dropped her own serve for the fourth straight time without much resistance. A key turning point came in the next game, when Sam again fell behind 0-40 before climbing out of the deficit with penetrating groundstrokes. Saving two more break points before the game ended, she established a 3-1 lead more through perseverance than brilliance. With a double-break advantage hers, Stosur had two opportunities to serve out the match and clinch her berth in the third round. In a stunning twist of events, she could convert neither of them, never arriving at a match point. The invigorated Zheng fired a series of fierce groundstrokes to reach 5-5 and thrust the pressure squarely back on the favorite’s shoulders. Never a player who surrenders easily, the Chinese forced Stosur to fight for each point that she won, a task that her faltering nerves struggled to handle. Serving to stay alive now, Stosur quickly fell behind 0-30 with a backhand error. Two points later, Zheng cracked a forehand winner down the line to set up double match point. At that moment, Stosur ended her own misery with a gruesome double fault into the net that completed her stunning collapse, 6-4 1-6 7-5, and left no home hopes in the women’s singles draw here. Before the third day of the 2013 Australian Open ended, only Tomic and Duckworth remained among the legions of Aussies who had arrived in Melbourne. Here’s a roundup of funny photos from Day Eight of the Australian Open featuring players Kvitova, Tsonga, Ivanovic, Murray, Ferrer, Hewitt, Gasquet and Lisicki among others, Tebowing, calling on the tennis gods, and of course, stripping. This is a photo of Lleyton Hewitt looking for his wife Bec, right? I mean, there cannot be another explanation for this, RIGHT?? In recent statements, Serena Williams has said she “doesn’t love tennis, today” and it seems like tennis doesn’t love her back either. Watch out for those vicious inanimate objects we call tennis racquets, Serena. They’re out to get you, gurrrl! Perhaps she heard me and is actually apologizing to the tennis gods. But maybe she’s singing and dancing. I can’t really tell. 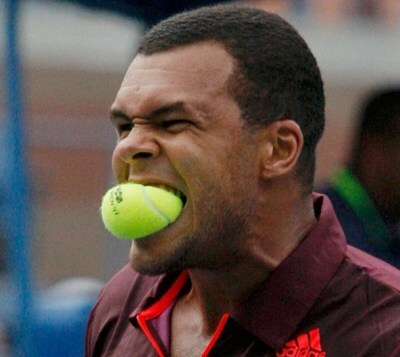 Not only is Jo-Wilfried Tsonga’s adidas kit so much better looking in the promotions than on-court, but he’s also missing the tennis ball in his famous “ball-biting” face! This photo is pretty tame, but the caption makes me scratch my head: “Zheng Jie of China wears an ice pack.” Since when did ice packs become a new fashion accessory, Getty? Not sure the ice pack is getting the proper treatment — maybe they should get Marcos Baghdatis to promote it. You cannot outdo a good “head stuck in shirt” shot ala Richard Gasquet. A+ for execution. B- for not flexing your abs, Reeshard. Tsk tsk. Uh, how did these get in here? Anyways. Tomas Berdych seems to have gotten my abs-flexing memo during his afternoon at the beach on St. Kilda. You’re welcome. Surprise quarterfinalist Ekaterina Makarova is multi-talented. Not only did she beat Serena Williams in two easy sets, but she was watching Championship Sunday football games at the same time: GOALLLL! Good girl Sabine Lisicki seems to be hushing the crowd in a Berdych-esque way, when in fact she was simply challenging a call. Angles, angles, angles. And in similar news: placement, placement, placement. Oh, Andy. You make it too easy for us. And finally, if only because these types of photos have become so common in the past year, dead spots in million dollar tennis tournaments. Here, an official uses a powerdrill during the Kei Nishikori vs. Jo-Wilfried Tsonga match.